After 7 sessions of basic salsa, we've pretty much mastered all the dance moves our instructors taught us. Problem is that I usually forget a couple or two by the next session. Another problem is that we're still dancing pretty much via voice control. The instructor shouts out the move, and we execute it. Yeah, I know the guy is supposed to lead, and all the lady needs to do is to follow. Easier said than done. Basic - Easiest of all moves. All salsa steps are done in counts of eight. For the basic, left foot steps forward, right foot steps in place, left foot returns to position, and rest. Second half of the basic has the right foot stepping backward, left foot stepping in place, right foot returning to position, then rest. Rhumba - This is the side-to-side move of salsa. Crossbody - Similar to the basic, but the partners swap position. On the fourth count, the guy's body is facing left. 5-6-7, the guy uses the left hand to guide the lady across. 8, the couple faces each other, positions exchanged. Open - Similar to Basic. On the first count, the guy releases left hand, left foot steps sideward-back, so the guy's body is facing left. 2-3-4, partners return to position. For the second half of the Open, the couple opens to the right side (from the guy's point of view). Boy Turn Girl Turn - Not sure if that's the technical turn for it, but that's what our instructors called it. Exactly what it says. Two sets of 8 counts are needed for this step. Start off with the Basic, on the seventh count, the guy raises left hand. 1, left foot forward. 2, the guy does a 180-degree turn clockwise with both feet in place. 3, right foot pivots, and the guy does another 180-degree turn. 4, he's back in position. 5-6-7, the girl does her turn. 8, partners in position. We also learned the Shuvla, the Hammerlock, and the Ochienta. These steps are quite complicated (to me), and I've pretty much forgotten how they work. I hope my instructors are not reading my blog. 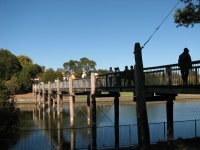 Saw an ad in the community newspaper about the Riverlife project. It's a joint initiative of the councils of Marrickville, Canterbury and Strathfield, funded by Department of Environment and Conservation, to promote environmental awareness of the Cooks River through guided tours. 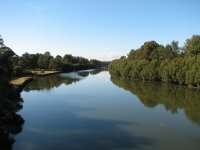 The project does different kinds of tours, and the one I signed up for is called the Cooks River "Sweet & Sour" History and Photo Tour. We start off at the Sugar Mill near the Canterbury train station. Our guides gave us a short history of the place, how the first migrants came to Canterbury, how the Sugar House evolved, etc. They also showed us old black-and-white photos of the river views and surroundings taken in the late 1800s and the early 1900s for comparison. We crossed the narrow bridge to the other side of the river, and walked along its bank. The guides provided a running commentary on the history of the river, the flora and fauna. We circled back to our original meeting place, then walked upstream to the Cup and Saucer Creek, then back again. If you're wondering why it's called the "Sweet and Sour Tour", suggest you sign up for the tour as I've forgotten. As before, there's a huge turnout for this year's World Press Photo at the State Library of NSW. Definitely need a bigger venue next year. People were milling about, trying very hard not to get in other people's line of sight towards the photos on the boards. This year's entries concentrated more on the tragic side of world events: the war in Iraq, Hurricane Katrina, the tsunami and earthquake in Indonesia, violence and hunger in Africa, etc. Some of the photos can be pretty gruesome, so be warned. 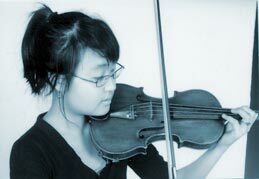 Suyeon Kang, 2005 Australian Young Performer of the Year, joins the Willoughby Symphony as solo violinist with 2002 Australian Young Conductor of the Year Ollivier-Phillippe Cuneo conducting. I liked the violin concerto, but Schnittke's piece is way too avant-garde for me. The instruments were (intentionally) being played out of synch and out of tune, the music actually bothered me. By then, I was not in the mood to appreciate the Farewell Symphony anymore. Football fever hits Sydney. Aside from the football-related advertisements in the tri-media, some TV programs now have a football theme. SBS, being the 2006 World Cup broadcaster, has two such shows. Song for the Socceroos, where your average-Joe singer/songwriter/band tries to come up with a um, song for the Socceroos. Winning criteria? It has to be simple and catchy enough so the even the drunkest of drunks can sing it to cheer on the Australian team. My personal choice? Here Come the Socceroos. Most people seem to like Green and Gold, though. The other program is Nerds FC. Fourteen nerds and geeks with different interests and specialties. A bunch of them are into computers, gaming, AI, etc. Another's a linguistics geek, who speaks seven languages and even invented his own. You've got subject experts on cars, ships, politics, history, etc. What do they all have in common? They don't know a thing about football, specifically soccer. And after three months of intensive training, they're supposed to take on the Melbourne Victory in front of packed stadium. I really have serious doubts about this. I mean, instead of doing hard-core training, these guys spend their time fooling around in some team-building exercises, learning samba from some Brazilian girls, recording a team song in the studio, shooting a music video, getting a total makeover from fashion consultants, having friendlies with the Young Matildas and some prison inmates, etc. In our strong desire to get away from the office, a bunch of us signed up with our internal volunteer program to do some work at the Mirrabooka Retirement Village. As to be expected, lots of people signed up, but something like half of those people actually turned up on the day. We were divided into two groups: one group is supposed to plant some trees, while the others are to take out all the weeds on the retaining wall. They forgot to tell us that the whole retaining wall stretches one whole block, and that the weeds have been running wild for years. Doing the weeding at home is more like a leisure activity for me, but here it's manual labour. At home, I search for weeds among the grass. Here, there's no need to be selective; just pull out anything growing on the retaining wall. By lunchtime, my arms, hands and fingers are all sore. We had a really nice barbecue meal with the residents. All of them are quite old, but very healthy. Many of them are more than 85 years old. Most of the time they play bingo or the pokies, do shopping and watch movies. There would be shuttle buses that transport them from place to place. After lunch, it's mostly clean-up work. Got rid of the remaining weeds. Spread some mulch around. Set up a temporary temp for next week's party. A great way to spend the Friday. 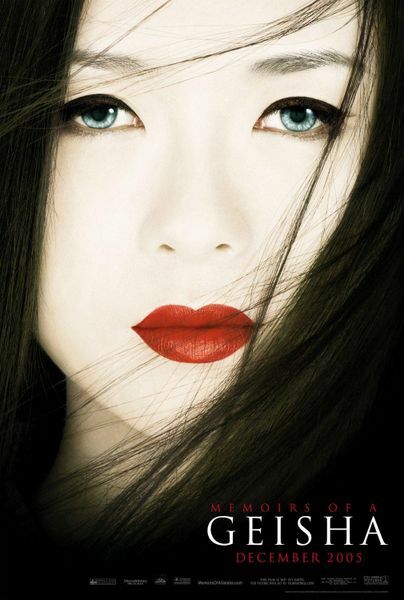 Wonderful, wonderful movie starring Zhang Ziyi, Michelle Yeoh, Gong Li, Ken Watanabe and Koji Yakusho. Read the book a few years back, and this movie really brings it to life. Watching it is like being transported to another place and time. 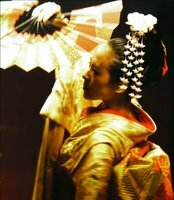 The movie follows the life of Chiyo: how she was sold to a geisha house, how she became a geisha-reject, how she met the Chairman (which became the turning point of her life), how Mameha trained her up to become a full-pledged geisha, how Sayuri (the former Chiyo) got to meet her Chairman (and Mr. Nobu) again, how the War came and disrupted everyone's plans, how the Chairman and Mr. Nobu made their comeback with a little help from the Americans (and the former geishas), how Sayuri disgraced herself in the eyes of Mr. Nobu with the incident with the General, how that turned out to be a good thing, and how she and the Chairman eventually became a couple. Powerful acting, exotic costumes and sets, intriguing plot. 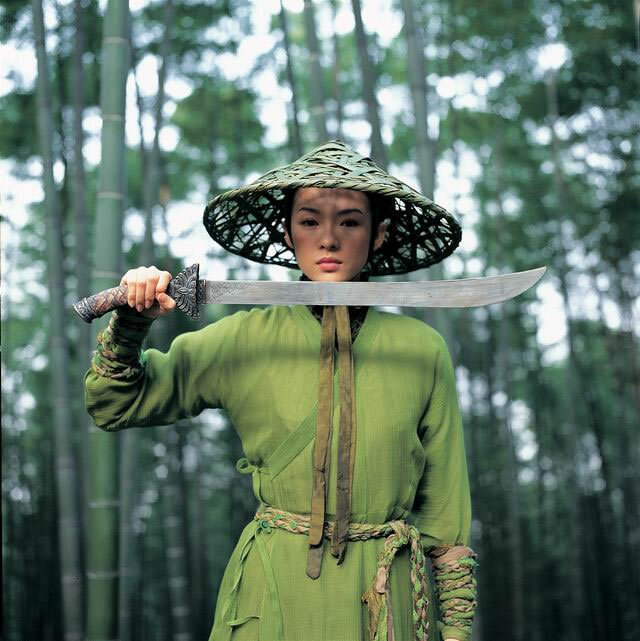 Another wuxia movie from director Zhang Yimou. A bit short on the plot side, but there's no shortage of star power, grand cinematography, and exaggerated fight scenes. There are two ways to look at this movie. You can view it as a story about government corruption and avenging secret societies. It's also a movie about love and betrayal. 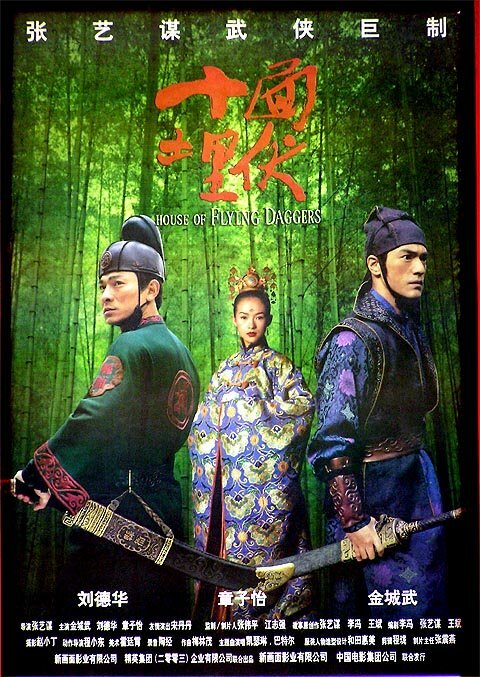 The movie is set in 859AD Tang Dynasty. 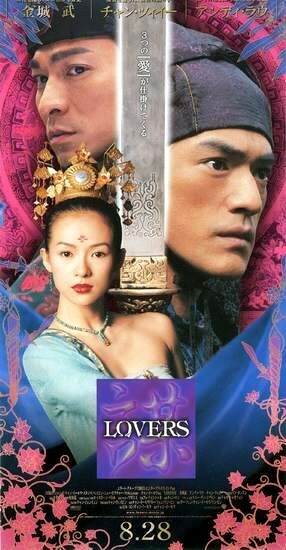 Andy Lau and Takeshi Kaneshiro plays two police captains Leo and Jin of Feng Tian county investigating rebel group House of Flying Daggers. A new brothel called Peony Pavilion opens up in their locality and they suspect that the star dancer Mei (who is blind) might be connected to the group. Leo and Jin tried the good-cop-bad-cop routine on her. Leo arrests her and locks her up in the county jail. Jin pretends to be a righteous swordsman, and rescues her from the prison. They flee together for three days, all the while being attacked by government troops. 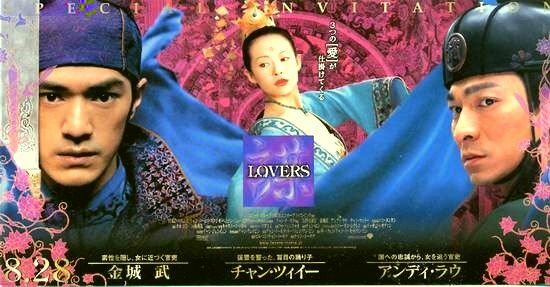 Mei being the luscious Zhang Ziyi and Jin being the long-haired Takeshi, the two fell in love. In a particularly tight situation, they were rescued by the Flying Daggers. SPOILER ALERT! SPOILER ALERT! Turns out that Nia, Madam of the Peony Pavilion, is the leader of the rebel group, and Mei is just one of her soldiers, and not the former leader's blind daughter, as originally imagined by Leo and Jin. Nia's no fool. She knew all along that Jin is a copper, so she orders Mei to bring him outside and kill him. She herself brings the captured Leo outside. More revelations: Nia is actually Yee, acting as proxy for the big kahuna. And Leo's actually an undercover agent for the Flying Daggers. Three long years he's been doing this dangerous job - just to impress Mei and win her love. Now, the true test of true love: would you sacrifice your life to save your lover's? Jin walks towards Leo. By shortening Leo's striking range, he'll be dead before Mei can intercept the dagger. He uses this strategy to dissuade her from pulling out her dagger. Disgusted by such display of mushiness, Leo strikes. Without a second thought, Mei reacts. We see (in slow motion) Mei's dagger cutting cleanly through a drop of blood. It was just a bluff by Leo, and Mei fell for it. Leo gave the test, and Mei passed with flying colors. She dies in Jin's arms, while Leo walks away. "A rare beauty of the North. She's the finest lady of the Earth. A second glance leaves the city in ruins. Than a beauty like this." The whole Finnish population is around 5 million. 10% of that (or 0.5M) lives in Helsinki. Finland was under Swedish rule for 650 years. It was under Russian rule for 110 years. Stockholm used to be the capital, then Czar Alexander made Helsinki the Finnish capital. 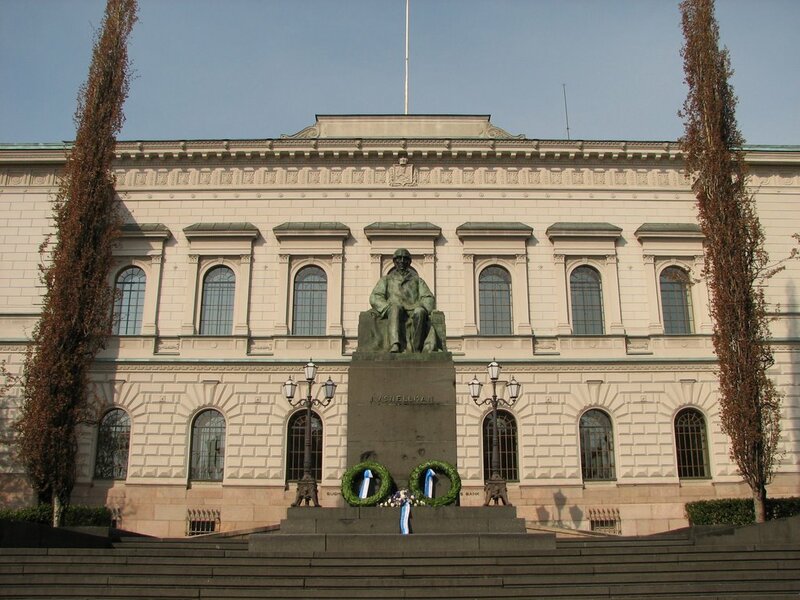 Finland finally got its independence in 1917. Finland has two official language: Finnish and Swedish. 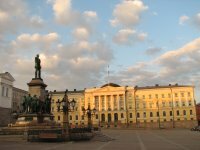 Less and less Finns are studying Swedish now. 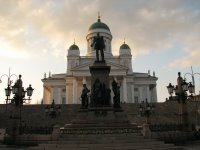 Helsinki has a hundred kilometers of shoreline, tens of thousand of berths, and lots and lots of marinas. People usually bring their rugs down to the wooden jetties to wash.
Education is compulsory and free for kids from ages 7 all the way to 16. Health care is also free. There are about 400 main libraries, and most of them have Internet access. There are around 2 million saunas in the whole of Finland. Babies are born in the sauna, and the dead are laid there to rest before burial. It is said that when Finnish troops are deployed abroad, a sauna is the first thing they build - even if they're in the middle of a desert. Favourites: summer cottages, sauna, sausages, fishing, ice cream, salmon, red herring, strawberry, rye bread, cured ham, coffee, beer, vodka, small talk - NOT! On with the tour. Meeting point is at the Helsinki Expert Kiosk right in the Esplanade Park, beside the Elva Stage. The bus is painted very distinctly, so you won't miss it. My suggestion is that you be there half an hour before departure time. The ride is very popular, and it's first-come-first-served. Once on the bus, you're provided with a Sennheiser headset that you plug into the seat in front of you to hear the audio commentary. By pressing the up/down buttons, you have a choice of 10 languagues, including Latin. Actual tour starts at Esplanade Park. The park used to be a meadow watched over by a shepherd by the name of Pasteur. Why a Frenchman would be in Helsinki hundreds of years ago, I don't know. Pasteur lives in a small wooden cottage, and people started calling it The Chapel. That cottage is now long gone, and in its place you see this classy cafe called Kappeli. Moving on we stop at the Senate Square. In the middle of the square is a statue of Czar Alexander II, who made Helsinki the capital of Finland. 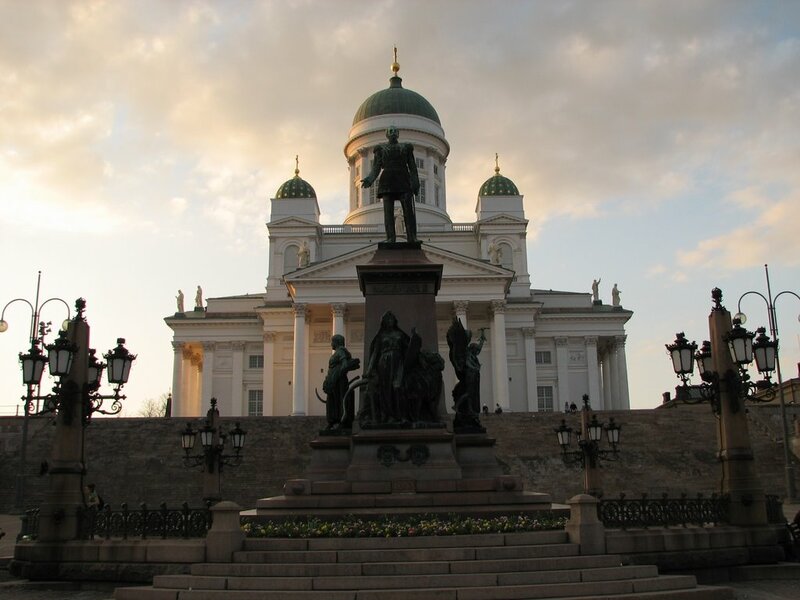 Behind the statue is the Helsinki Cathedral. If you stand on the steps in front of the cathedral, to your left is the Council of State, which is the Prime Minister's office. On your right is the Helsinki University. 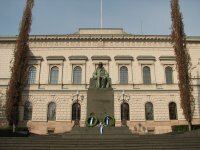 At the back of the square, we pass by Crown Plaza, the National Archives, and the Bank of Finland. 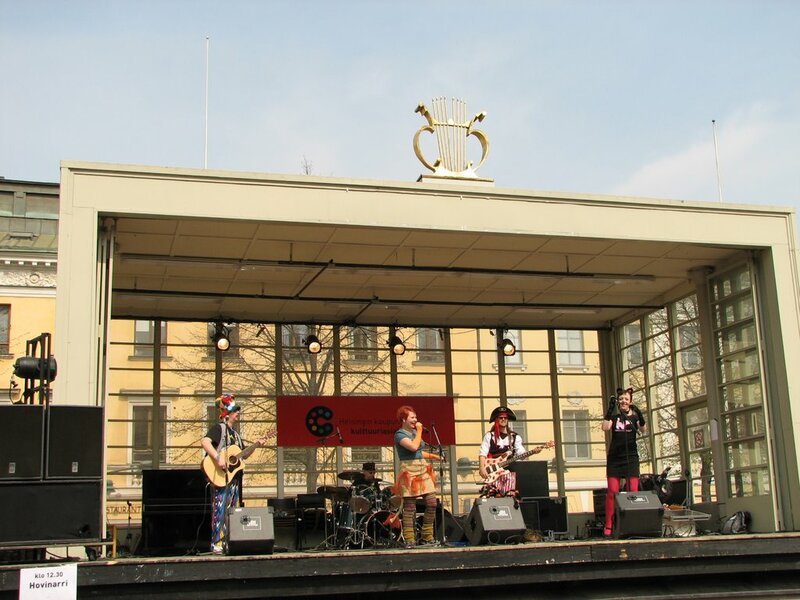 (In 2002, the Finns switched from markka to euro.) Across it is the House of Estates, meeting place of the clergy, burghers, etc. 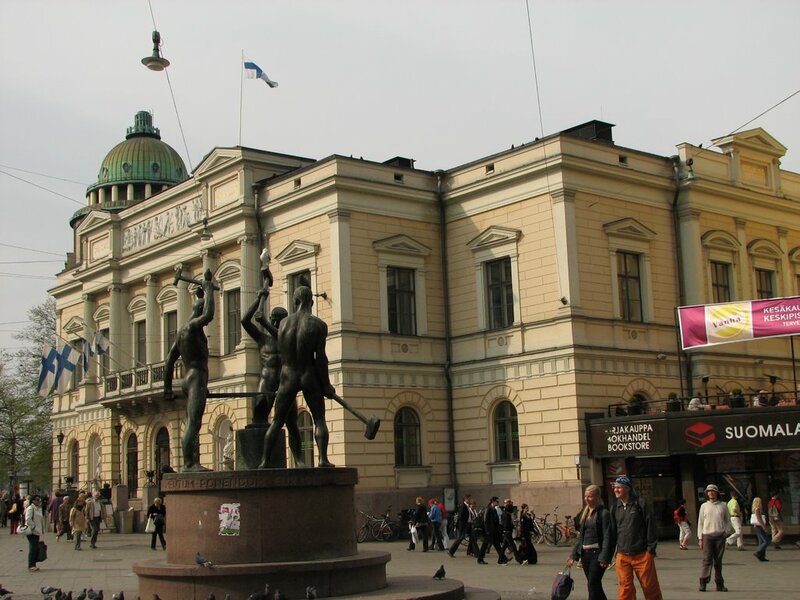 Further down the street is the Bank of Finland Museum. Turning left, you'll see the Soderberg House, which is the residence of the Lord Mayor. 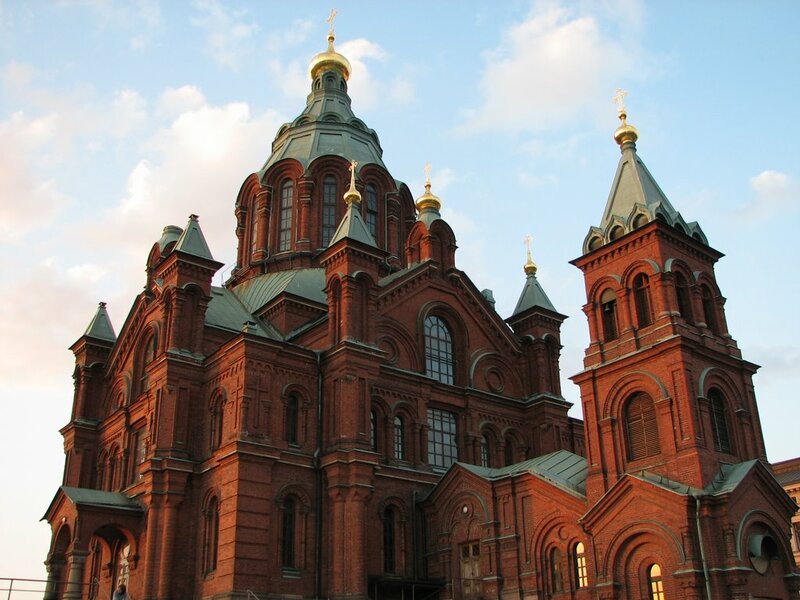 It's also the oldest building in Helsinki. Further down on your left is the House of Nobility with a mini-park in front of it. 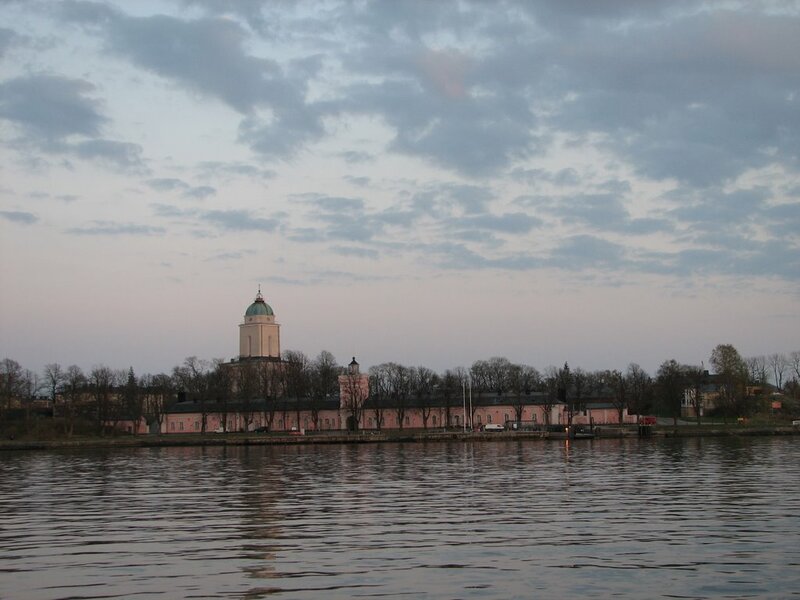 Following the road, you'll see the Helsinki Garrison on the right with the lone soldier standing guard. On the left is the brick-red Uspenski Cathedral. The main golden dome represents Jesus, while the 12 smaller domes represent the apostles. Back at the Market Square, on the left are the Presidential Palace and the City Hall. 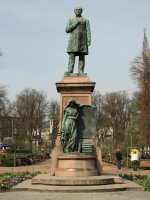 In the middle of Market Square is a monument (with a bronze double-headed eagle on top) erected in 1836 to commemmorate the visit of Czarina Alexandra. 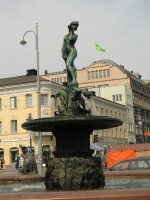 Turning left, you'll see the Havis Amanda fountain - the symbol of Helsinki. Next, we pass by the Old Market Hall, and we end up at the Olympic Terminal, where the huge Viking and Silja ships dock. 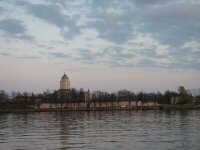 From the South Harbour, you can see the Suomenlinna Sea Fortress. Made up of 6 islands, Suomenlinna has about 1000 permanent residents and is a UNESCO World Heritage Site. Next, we pass by Kaivopuisto Park and the Eira District. Lots of Art Nouveau buildings here. At this point, I started to get data overload. All I remember is that we passed by the old Sinebrychoff Brewery, a weekend flea market, the Museum of Foreign Art, and the Alexander Theater, which used to be the National Opera. We end up on Boulevardi, which is another popular shopping street. Along Boulevardi, you'll find the famous Ekberg Cafe and this wooden church, which is around 170 years old. 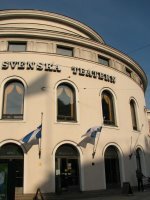 Turning to Mannerheimintie, which is the main street, you'll see the Swedish Theater and the Stockmann, the largest department store in the Nordic region. As they say, if you can't find it in Stockmann, you don't need it. 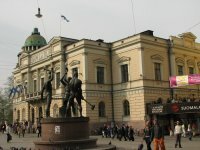 In front of Stockmann is the statue of the Three Smiths. Not sure what its history is. Behind it is the Old Student House. Further off are two famous local restaurants - Zetor and La Tour. On the other side of Mannerheimintie are some shopping centers - Forum, Glass Palace, and Sokos. 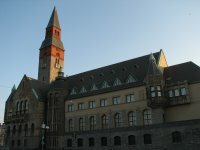 Across the street is the Post Office with its museum, library, and cafe. 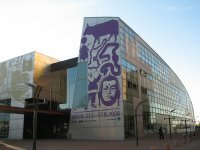 Right beside the post office is the Contemporary Museum of Kiasma (meaning crossover). Slightly across it is the Finnish Parliament. 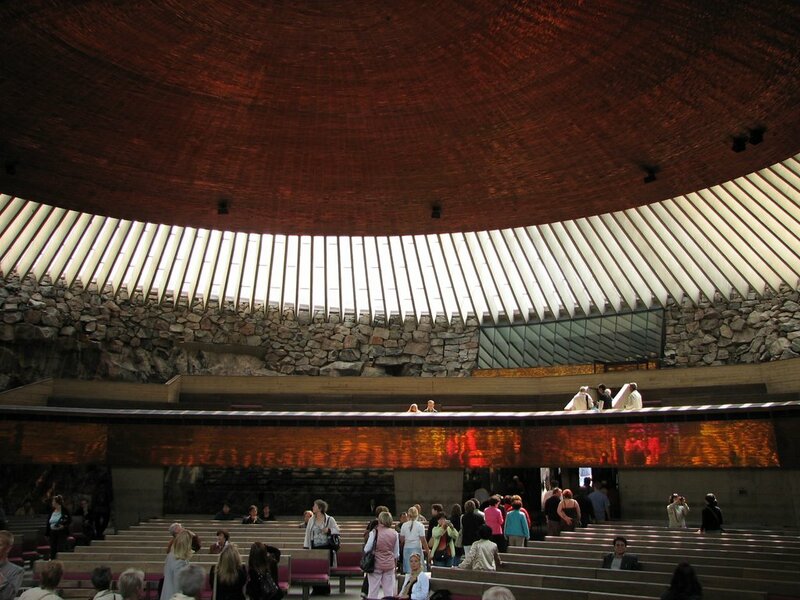 We made a scheduled stop at Temppeliaukio Church, a.k.a. Rock Church because it's built right into one side of a hill. 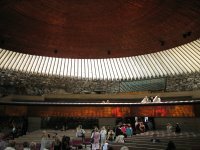 It has a copper ceiling, which made use of 22kms of copper wire. Acoustics is said to be very good. After 10 minutes, we continued on with the tour. You'll notice two Schools of Economics - one Finnish, one Swedish. Passed by Hieteniemi cemetery and Hietaniemi beach, then made another stop at the site of the Sibelius Monument. The place has quite a bit of history. Apparently, there's a big public disapproval when Eila Hiltunen was commissioned to do the monument because her design was so radical. Constructing it was no easy task - together with an assistant, Eila Hiltunen spent four years welding the 600 acid-proof stainless steel tubes. By the time the work was unveiled in 1967, she was afflicted with chronic bronchial asthma from the toxic metal fumes. 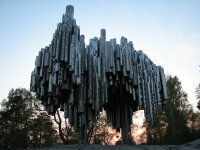 Nowadays, the Sibelius Monument is one of the not-to-be-missed sights in Helsinki. On our way back to Esplanade Park, we pass by the Tram Museum. Back on Mannerheimintie, we see the Olympic Stadium and the Linnanmaki Amusement Park on the left. On the Toolo Bay, you'll see the nice wooden villas. On the right, right in front of the Crowne Plaza Hotel is an art installation called Ode to the 60,000 Lakes. 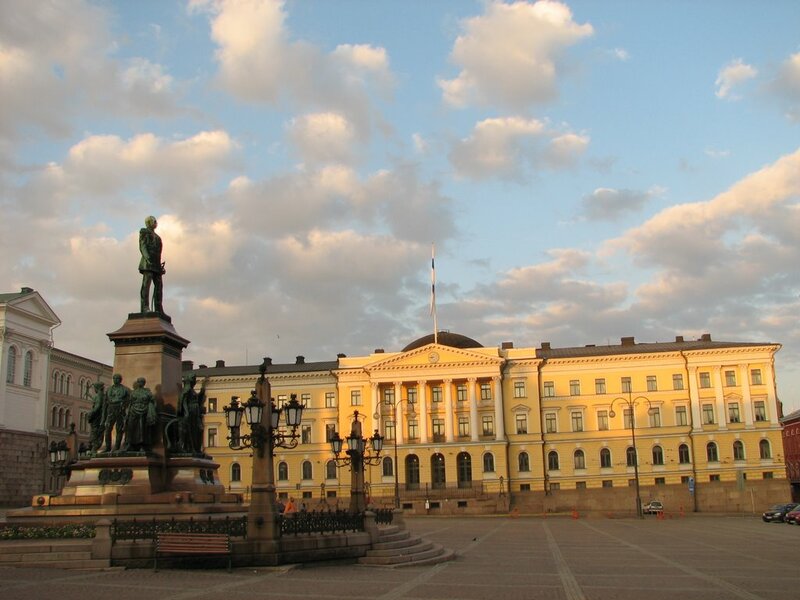 Further on, you'll see the National Museum on the right and Finlandia Hall on the left. 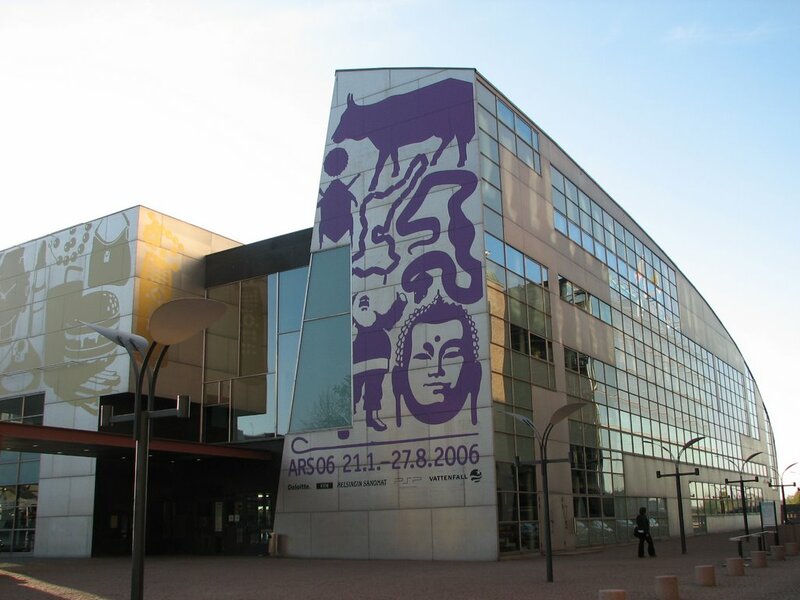 Next comes the Helsinki City Museum, the glass and steel offices of the Helsingin Sanomat, then Kiasma again. The bus takes us back to Esplanade Park, and that's the end of the tour. With nothing else better to do tonight, I thought I'd catch a bit of culture. 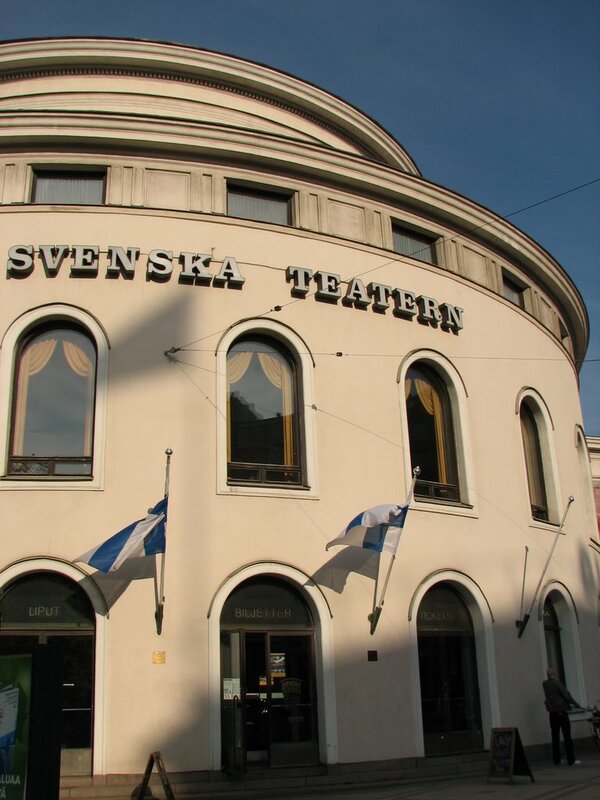 Helsinki This Week tells me Oscar Wilde's The Importance of Being Earnest is playing at the Savoy Theatre. 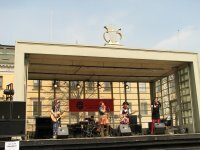 It's being staged by a local theatre group called MaDraK. Fortunately for me, it's going to be in English (British, actually). Never heard of the group MaDraK before, and I've never seen how Finns do their plays, so I thought why not? I got to the ticket counter half an hour early because I don't want to miss out. Apparently, there's only one ticket price, 15 euros. I asked the lady at the counter to show me the seating plan so I can choose a good location. Oh, it's free seating. And what time should I come back so I can have first crack? She assured me there'll be lots of seats available, and that I can simply walk in 5 minutes before the show. She even suggested I have a think and come back later to buy my ticket. First rule in Salesmanship 101: Never give the customer a chance to have second thoughts on a potential sale. As I was munching on my Big Mac, (I wanted a Hesburger, but couldn't find it), I started thinking: "If the play's good, how come there are still lots of free seats?" Call it sheep/mob mentality, but I call it human nature. By the time I finished my fries, I've decided to sample a different form of culture/entertainment. For an additional 2.50 euros, I watched a concert by the Helsinki Philharmonic Orchestra at Finlandia Hall, featuring soloist Sarah Chang and conductor Lawrence Foster. I find it quite surprising that majority of the audience are way older than me, and like 90% are in formal attire. 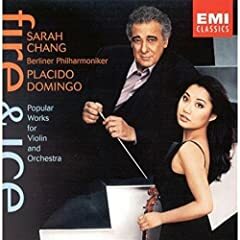 Anyway, I thoroughly enjoyed Sarah Chang on her Fire and Ice CD (conducted by Placido Domingo), and tonight she didn't disappoint. She looked magnificent - white skin on off-shoulder black dress. And she played well, too. :-) Just before she started her solo part, she even limbered up her arms and neck, just like an athlete would. Her playing time was relatively short, but ferocious and passionate way that she played more than made up for it. Didn't bother to bring along my camera because I assumed I wouldn't be allowed to take pictures inside the concert hall. I checked with the lady at the door, and my assumption was wrong. Hooray for camera phones. If you happen to be staying at Scandic Hotel Continental, and needs to be at Kutojantie, Espoo before 9am, the bus is your best option. There are two buses you can take: Bus 213 at 8:22am and Bus 212 at 8:32am. They share a bus stop, and it's across the road. Bus 213 will get you to Kutojantie a little before nine. However, if you woke up late, but still want to finish your breakfast of fruit juices, bacon and egg, sausages, muffins, croissants, meat slices, cereals, and fruit, you can till take bus 212. You'll just get there a few minutes a little after 9am. If you really like your breakfast, and decide to get seconds, you'll have to catch the tram to the city (lines 10, 4, or 7), then from there take the train from Central Station to Kera. If you can't help preparing a doggie bag for take-away, I suggest you just take a taxi. Helsinki taxis are very nice, usually either Mercs, Volvos, or Peugeots, and they have the taxi fare to match. A single ride is more than enough to buy you a 5-day regional ride-all-you-can pass. Where to get off? Always something good to know. You don't want to end up at Mikkela or Kauniainen, and have to take the bus back. From Mannerheimintie, the bus will take you out of the city centre and turn left towards the expressway. At one point, it'll make a right, and you'll see Scandic Espoo on your right. That's the one with a huge sign saying "Scandic Colonial Bar & Kitchen". Get off at the next stop. Don't worry. Almost everyone on the bus will be getting off too, so that's your cue. 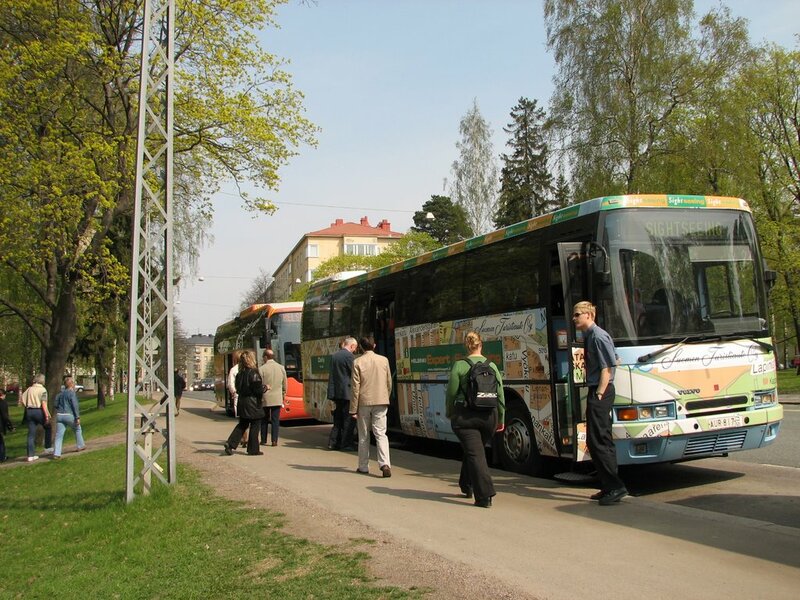 To get back to Helsinki, you can take the same bus 213 on its return route. You can also take 110T or pretty much take any bus which says Helsinki. It's not that big. Or you can walk over to the Kera train station. The bus ride takes half an hour, but is more regular. The train takes 15 minutes. As you can figure out, I quite like Helsinki in spite of the cold weather. Actually, it's the middle of spring/summer, so the weather's pretty nice. No snow in sight, and the flowers are out in full-bloom. As we pass along Mannerheimintie, all the quaint little shops I've seen two years ago are still there - the souvenir shops, the convenience stores, the bridal store, the shop selling cart wheels, the crafts shop, etc. The architecture and colours are a bit bland, but utilitarian. Nothing seem to change much here. Interestingly enough, I don't think I've seen any construction work in the city. Helsinki gives me a sense of stability. The locals are helpful, but they're not fussy. They might seem a bit cold and impersonal, but that's just their way of being no-nonsense. And they're getting better all the time. Scandic Hotel Continental is exactly as I remembered it from last time - the doors, the carpet, the front desk, the lobby chairs, the bar, the restaurant (even the waiter), the rooms, and the cable TV channel selection. There's CNN, BBC, and NHK, a couple of Finnish, Swedish, and Russian channels, plus some radio stations. They do carry Classic FM 92.9, so I'm good. 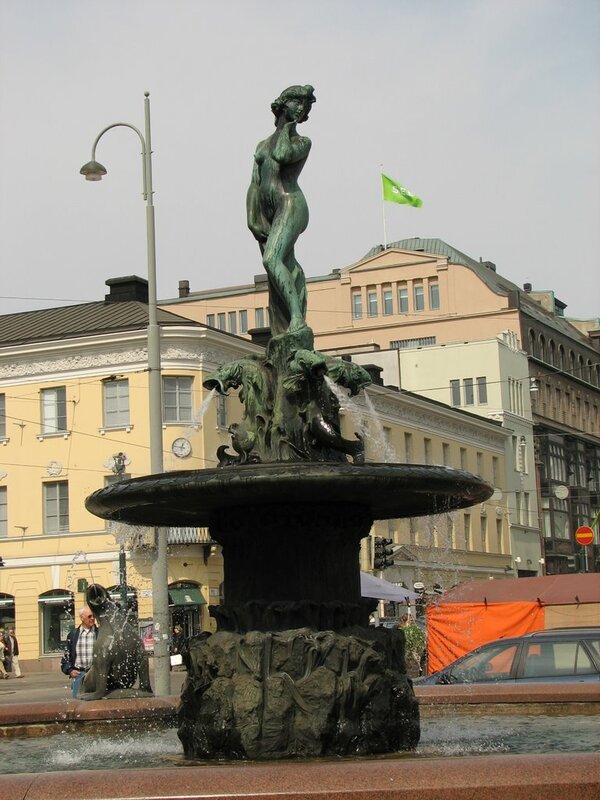 Had a short break, then walked the length of Mannerheimintie to the Central Train Station in the city centre. You have to be careful when walking on the sidewalk. There's a bicycle lane and a pedestrian lane, and you don't want to be in the wrong lane. It's already 6pm, I was expecting the HKL office to be closed already. Last time I was here, they close around 5pm. Pleasantly surprised to find that it opens till 7pm. As I'll be traveling from Helsinki to Espoo for the next 4 days, and going around the city after office hours, the lady at the counter suggested I take the 5-day regional ticket. That's 30 euros for 5 days of unlimited use on any form of public transport - bus, tram, metro, train, or ferry. Just a few meters away is the Main Post Office. I popped in and bought a packet of used Finnish stamps for 7 euros. Took the tram back to the hotel. Another interesting thing I noticed is that almost nobody on the tram listens to an MP3 or CD player. And no fare inspectors. Still on Sydney time, I stayed up till late. Even around 1am, it still doesn't get 100% dark. Haven't flown with Qantas for quite some time, but it's not too bad compared to Singapore Airlines. The seats seem newer and a bit more spacious, and the controller/handset is definitely much better than SQ's. For one, it has rounded sides - not blocky. It's coloured black and has a nice dot-matrix LCD screen. However, unlike KrisWorld, the in-flight entertainment system is not on-demand. You still get your movies, news, TV shows, CDs, radio programs, and games, but you can't pause, fast-forward, or rewind. If you happen to choose a bad movie, you can stop it, but when you switch to another channel, you have to start the other movie mid-way. Either that, or you wait for ALL movies to finish, then wait for the system to replay the movie you want. First chance I got, I watched Woody Allen's Match Point. Because of the fixed scheduling, I can't proceed to the next movie once that's over. That gave me ample time to start reading Catch Me If You Can. We got to Singapore just after midnight. Most of the shops are still open, but there's relatively few people about. It's just a quick stopover, so back on the plane and off to Heathrow. Watched The Matador, then finished reading the book. Oh, more good things about Qantas - wines in mini bottles and Cadbury hot chocolate drink. Arrived at Heathrow Airport around 7am. It's my first time in London, and as expected, it was cold (11 degrees), dark and raining. Heathrow Airport is quite big. We actually had to take a shuttle bus to ferry us from Terminal 4 to Terminal 1. My flight to Helsinki doesn't take off until ten-something, so I had this great idea of hopping off the airport, getting on Bus 77 (which leaves the airport every half hour or so), and have a short tour of Windsor. But it is not to be. We were all ushered through the security checkpoints, and I ended up in this waiting lounge, where the only exit is to the departure gates. By then it's 8 am - not enough time for Windsor and back. Being my first time in Heathrow, I decided to explore the airport. Unfortunately, there's not much to see, and everything comes with a price. You have to pay to use the Internet terminals, the massage chairs, even T-Mobile's Wi-Fi. And the shops are not that many. There's Bally, Burberry, HMV, Harrods, WH Smith, etc. - all no good to me as I don't have a single quid on me. Walk over to the HKL office inside the Central Train Station (before it closes) and figure out which travel card to buy. I was running a little bit late already for my flight - bags not packed, lunch not had, but I figured I still have enough time to pop down Sanity and look for the other Lesley Garrett CDs. I was rewarded for my perseverance and effort. I managed to find disc 3 in the bargain bin. Rifled through the trays, but disc 4 is definitely not there. Well, 75% is still better than half. Further down, Giordano is having its "Nothing-over-$20-second-item-$5" sale. Ah, I'm sure the flight can wait. I managed to get back home, have a late lunch, and cram everything into my luggage. Got to the airport two hours before the flight, but the check-in queue is already snaking around the airport. Truly a sight that will strike fear into every traveler's heart. After an hour, the queue has already halved. The guy in front of me commented that this is probably the right time to come to the airport, instead of waiting in line for so long. I'll try that next time.